I’m a novice when it comes to classical music. I think that my appreciation of the genre stems from that of my parents. My mother met my father while she was studying at a music conservatory in New York. My father loved classical music and, I imagine, the soporific effect it had on me when played on the car stereo during long drives. These days, I still find certain performances calming, others uplifting and still others, exhilarating. 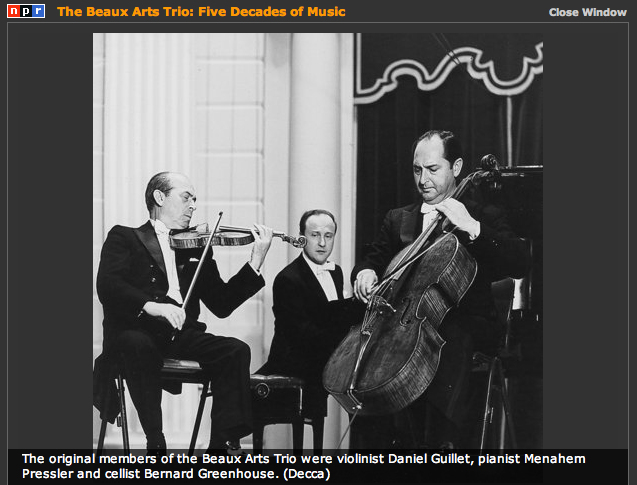 If you are in need of a little eye-opener this morning, please visit the Performance Today archive of the Beaux Arts Trio. Listen to their final concert given at Tanglewood, fifty-three years after their inaugural performance held at the same venue. You’ll be glad you did. 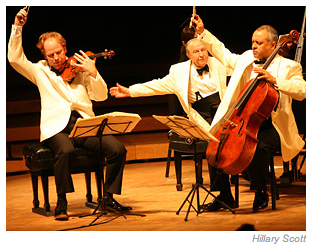 This entry was posted in Elegantology and tagged Beaux Arts Trio, classical music, Performance Today. Bookmark the permalink. Great site and a wonderful post for my first. Classical music is a wonderful part of an easy and elegant life. Just listen to what you enjoy and don’t worry about the technical stuff (sort of like drinking wine). The important thing is to not be intimidated or overwhelmed. When you want to learn a little bit more, pick up a copy of Ted Libbey’s NPR’s Listener’s Encyclopedia. Thanks for posting such a wonderful link. One of my favorite Christmas gifts when I was a teenager were season tickets to the Symphony. I always looked forward to getting dressed up, having a light dinner beforehand, and talking about it afterward. I felt so grown up. I typically tune in classical first thing in the morning while the little ones start on milk, and I on breakfast prep. It’s a nice backdrop for them to do their thing, for me to drink my coffee, and for all of us to ease into the day. I have a random sampling of CDs imported into itunes, or sometimes I plug in Pandora. Any chance you might recommend some favorites for such listening pleasure? My kids and I thank you. Hello MC, I love to start Sunday mornings with the soundtrack to “Brideshead Revisited.” Mrs. E. is firmly convinced that classical music should begin and end with Debussy. Satie is another house favourite. And of course, the canon. Glenn Gould’s Goldberg Variations (Bach) is phenomenal. Gade’s Jalousie is a ball and will summon up your inner Morticia Addams. Duet for Cello and Bass by Rossini, too. Gershwin and Bernstein make the cut as does Copeland. Many thanks, Mr. E, for what’s sure to be an upgrade to the musical library.